The ratcheting feature of the Lang serpentine belt wrench allows quick and easy positioning to access the tensioner from any angle. The Lang serpentine belt wrench features a slim head design for access to restricted areas, is heat-treated and nickel-chrome plated for strength, durability, appearance and long tool life. This Lang non-ratcheting serpentine belt wrench set is used to release tension on serpentine belt self-adjusting idler pulleys. The Fine Tooth ratcheting action allows quick and easy positioning of wrench-driving end for tensioner access from any angle. The Interchangeable adapters allow service to most serpentine belt applications. This set contains one 17mm single hex box wrench, and two 17mm drive end adapters with 8mm and 16mm working ends. Lang serpentine belt wrench for heavy duty trucks. Overall Length: 13'', reversible ratcheting wrench. 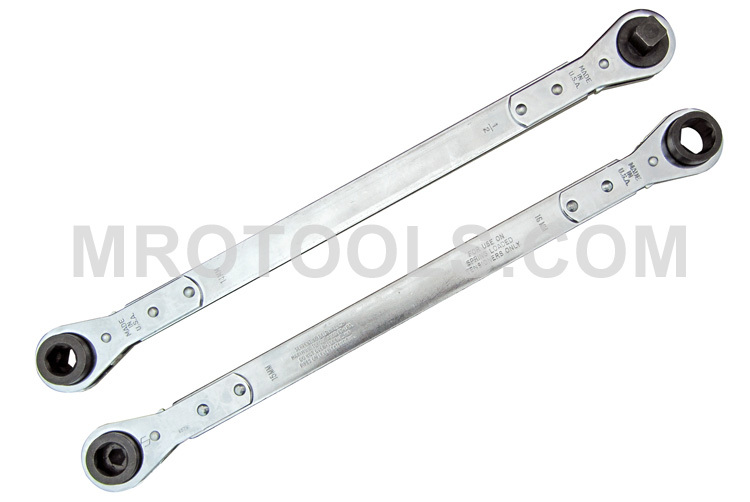 The 8584 Lang Ratcheting Serpentine Belt Wrench 2 Piece Set is one of thousands of quality tooling products available from MRO Tools. Please browse Lang Serpentine Belt Wrenches for tools similar to the 8584 Lang Ratcheting Serpentine Belt Wrench 2 Piece Set. 8584 Lang Ratcheting Serpentine Belt Wrench 2 Piece Set description summary: This set features: 8579 - 15mm 6 Point x 3/8'' Male Square x 16mm 6 Point 8585 - 13mm x 14mm 6 Point x 18mm 6 Point x 1/2'' Male Square Quantity discounts may be available for the 8584 Lang Ratcheting Serpentine Belt Wrench 2 Piece Set. Please contact MRO Tools for details.